1. How did you first get involved in coaching? What was your path to your position as head coach of the Mustangs? Coaching and teaching are two careers I have been interested in my entire life. Both of my parents were teachers, and my brother and I grew up attending the practices at our high school where my dad coached both boys and girls volleyball. I have been around the sport nearly my whole life so I have always known that volleyball would be a part of my life in the long term. After finishing my university playing career, I played professionally in Spain for a few seasons and then the opportunity to be a part of a university coaching staff presented itself. I was fortunate to spend a year as a graduate assistant at the school I played for (Hillsdale College, Michigan) and that was my first opportunity to learn as a coach at the next level. After that experience, I returned to Canada to teach and coach at the high school level. I soon got involved with Ontario Volleyball and was an assistant and then a head coach of the U18 Provincial Team program for four years. 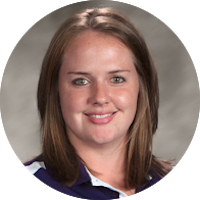 In early 2013, I received an email describing my dream career – full time volleyball coach. With some outstanding support and learning from my mentor coaches, I am now in my sixth season with our program. The years have really flown by! I have a couple of coaching mentors who have influenced my coaching style. First my competitive swimming coach – Scott Sheleystnsky. He was so creative and always demonstrated that he cared about us more as people than as athletes. Our entire team adored him and wanted to work hard for him because of the level of commitment he gave to making our individual sport feel like a complete team atmosphere. My dad (who is now one of my assistant coaches at Western) was also a coach who had a great influence on me – he coached both my high school volleyball and club volleyball teams and always made sure to bring humour to coaching and that is something I strive to do daily as a coach. Lastly, the coaches who were part of my university experience, Chris and Stephanie Gravel at Hillsdale College, created the most inclusive and welcoming family of any team I have ever been a part of. I learned so much from them about creating and sustaining a positive team culture. Honestly, I think about these coaching mentors almost weekly in the decisions I make as a coach. I would describe my coaching style as creative – I rarely run the same practice twice in one season – and passionate as I sincerely love the sport, love coaching and am excited for practice every single day. I love the challenge of creating the right system to suit the abilities and strengths of the current teams’ players, so that our team defensive and offensive system will look different each season for that reason. I also was fortunate enough to have some incredible travel opportunities as an athlete and am passionate about building those opportunities for our players. Our team has been to the Netherlands, France, Spain, Peru, Ecuador, and El Salvador together and I am already brainstorming our next team travel adventure. I have been fortunate enough to meet some really outstanding past coaches of Western Athletics teams, not only from my sport. The ones who stick out to me are the ones who clearly demonstrated a perpetual passion and dedication for their sport and their players. 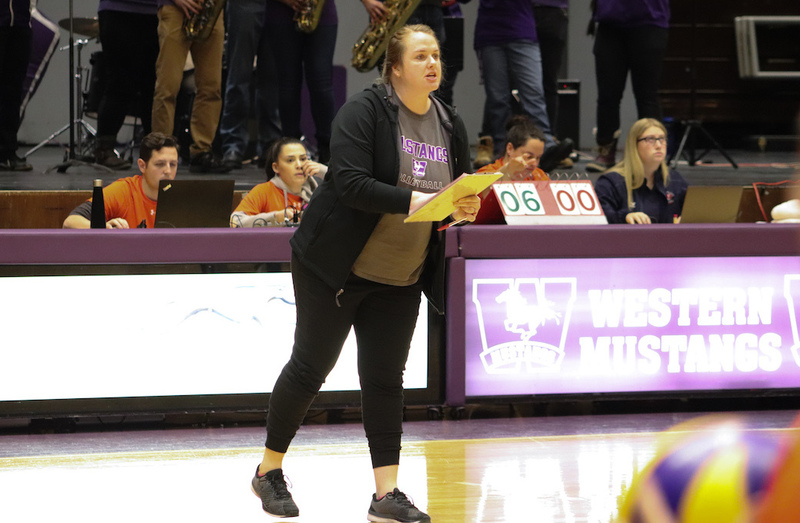 Fran Wigston Eberhard – a past coach of the Western Women’s Volleyball team – not only led her team to multiple national championships, but she helped fund international trips out of her own pocket just so her players could have the experience of a lifetime together. At 80 years old, she has such a humorous and bright personality and her dedicated support of our team to this day make me feel very fortunate to follow in her footsteps as a coach with the Western women’s team. Taking my team to a wilderness retreat with no cell reception and no wi-fi, having them all sleep in a big room together on dollar store pool inflatables and then wake them up at 6 a.m. with a bullhorn for a morning nature run. I am sure my 2013-14 team still has great memories of that weekend team bonding experience. I am really proud of each team that I have coached to an OUA medal in the past four consecutive seasons. Each team had a unique journey toward a similar end result and I think that is such an important lesson as an athlete – to enjoy the process and the day to day – not just looking forward toward the end goal. I also sincerely enjoy following the careers of the players who have graduated from our program in the past six seasons – being a job reference and getting a phone call stating “I got the job” for a player’s first real career opportunity, or seeing a player pursue higher education or exchange and international travel opportunities. I’s such a pleasure getting to know them as young athletes and watching them evolve into awesome, motivated young women! 7. What’s the best advice you can give to an athlete and/or athlete’s parents? Players should know that it takes more than talent to be recruited to be a varsity athlete. Coaches want the best people and teammates for their teams, not only the best players! You can really stand out in a positive way if you are respectful and courteous to your coaches, the officials and your teammates. Players should also take charge and take responsibility of their own path toward becoming a varsity athlete. Parents and coaches are of course there to support but becoming a varsity athlete is a huge decision and a huge commitment. As coaches, we want to hear from and get to know the player directly. Each year as a coach I recognize more and more the importance of creating balance for our student-athletes. My first year coaching, it would have been rare to take a day off, but now I like to give a day off here and there almost weekly to allow them to catch up academically or even have a night to enjoy being a university student! Some of the values and principles that I have never waivered on is the belief that as a team member, your personality, mindset and attitude are just as important or more as your technical skill performance. Every player should consistently strive to be the best teammate they can be – not only the best player they can be. I have a three-year-old son, Calvin, and he is the most fun sidekick I have ever had! Like me, he enjoys just about everything. I love to travel – I have been to 21 countries and counting. I enjoy being very crafty and creative and rarely do not have a project on the go. I also enjoy a good Netflix binge with my husband, Joe. When our team was in Ecuador during our trip to South America in 2018, I had a coaching first: During the gold medal final of our four-team international tournament, due to some extreme food poisoning I had to leave the bench for the first time ever in my coaching career to get sick. Luckily, the bathroom was right behind the bench and I think I only missed a couple points! 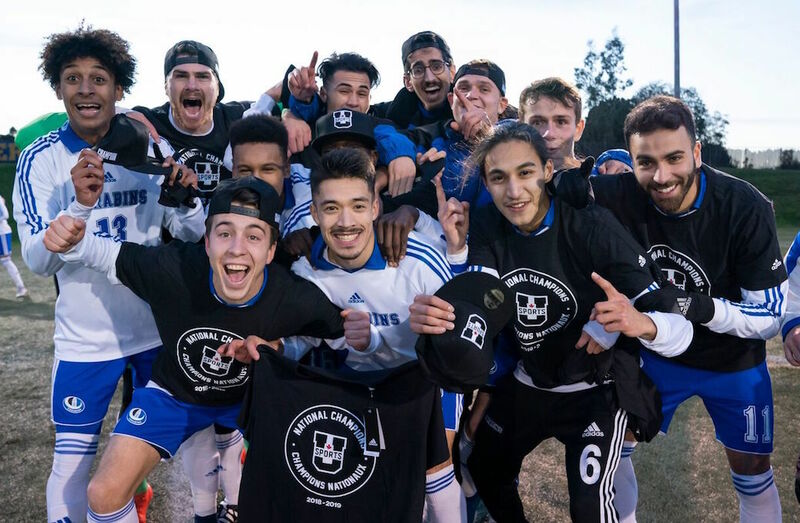 The reigning U SPORTS men's soccer champion Montreal Carabins will defend their title on home pitch next season as host of the 2019 edition of the national tournament.